string(1085) "Resource Centre > Uncategorized > Enhancing Detection of Human Trafficking Act"
(Sec. 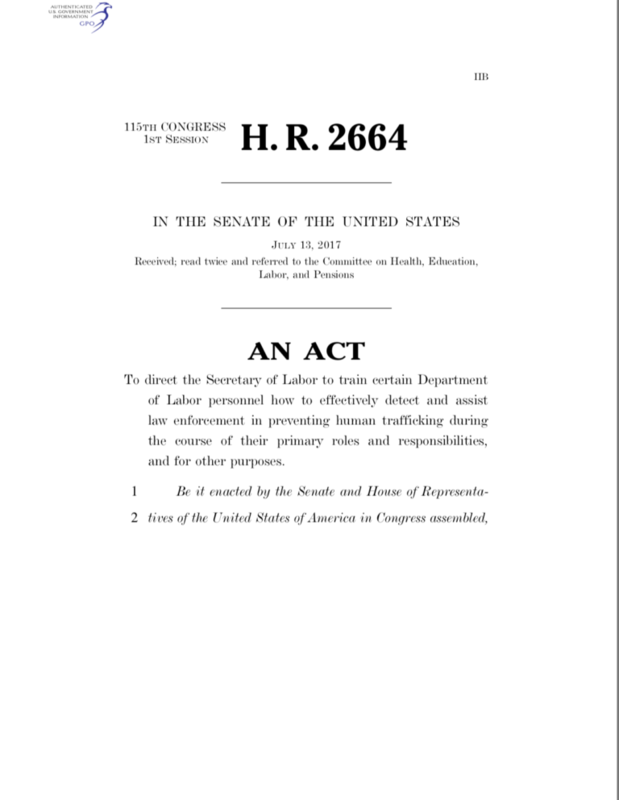 3) This bill directs the Department of Labor to implement a program to: (1) train and periodically retrain relevant Labor personnel to detect and assist law enforcement in preventing human trafficking during the course of their primary roles and responsibilities, and (2) ensure that such personnel regularly receive current information on matters related to the detection of human trafficking. Such training may be conducted through in-class or virtual learning capabilities and shall include: (1) methods for identifying suspected victims and perpetrators of human trafficking, (2) location- or environment-specifiic training, (3) other topics that reflect current trends and best practices for particular locations or professional environments, (4) a course of action for referring human trafficking cases to the Department of Justice and other appropriate authorities, and (5) post-training evaluation. (Sec. 4) Labor shall report to Congress annually regarding: (1) the effectiveness of the training, (2) the number of Labor employees who have completed such training, (3) the number of of human trafficking cases referred to Labor personnel, and (4) the metrics used to measure and track responses.